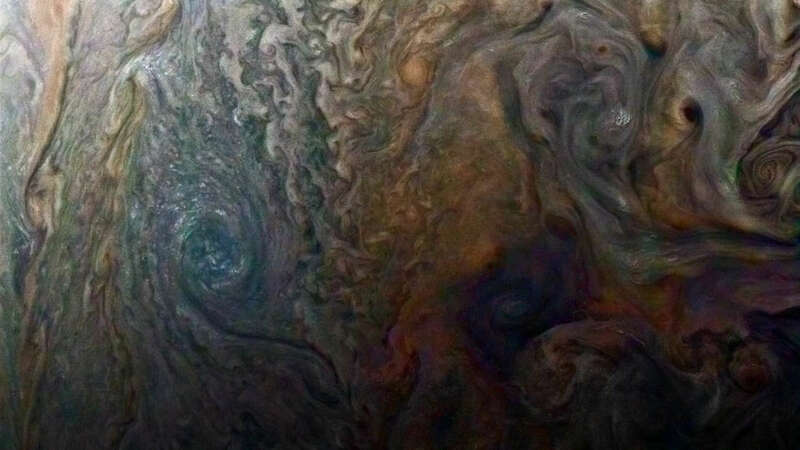 NASA’s Juno spacecraft has simply made its 5th flyby of Jupiter, and even as no information from has been released yet, NASA has dealt with us to a alternatively beautiful photo as a teaser. The flyby was scheduled to take place this morning at 4.52am EDT (9.52am BST). The spacecraft passes just 4,400 kilometers (2,700 miles) over the cloud tops of the gas giant, travelling at approximately 208,000 kilometers per hour. “... we're excited to look what new discoveries Juno will see,” said Scott Bolton, principal investigator of Juno from the Southwest studies Institute in San Antonio, in a statement. "on every occasion we get close to Jupiter’s cloud tops, we examine new insights that assist us understand this remarkable giant planet." This became the fourth “science pass” Juno has made from Jupiter, having entered orbit in July 2016, switching on its instruments to observe the world. however it’s also been the use of its camera, JunoCam, to snap photos of Jupiter as voted for by the public. One photo was enhanced by citizen scientist Roman Rkachenko to deliver out rich information in a storm and clouds at the surface. The photo, above and displaying the so-called “dark Spot”, was taken on February 2, 2017, from an altitude of 14,500 kilometers (9,000 milles). The photo was circled by ninety degrees to make it all of the extra impressive. It hasn’t all been easy sailing for Juno, though. A trouble with two valves in its primary engine has meant it will continue to be in its current fifty three-day orbit around Jupiter for the rest of it's mission, finishing 12 orbits through to July 2018. In fact, the plan was to reduce this to fourteen days and conduct 37 orbits through February 2018. We must still get plenty more brilliant photos like this, though.